This past weekend, I got to spend four lovely days in Amsterdam with my boyfriend. It was his first time there (with my first time being in the summer of 2012), and I was excited to show him this city I had spent only a day in, but immediately fell in love with on the spot. I couldn't imagine it could be more pretty than when I arrived the first time, but Amsterdam in the autumn is a treasure. After the Megabus ride from hell (so cheap, but so uncomfortable) I arrived in Amsterdam, early in the morning, ready to set out to meet up with Levi at the Anne Frank House. Amsterdam turned out to be less easy to navigate than I remember, because I thought I read the map right, but the canals are sort of like a maze at times, and after losing my way, I finally found some nicely marked arrow signs to point me in the correct direction. I found my boyfriend patiently waiting in line, we bought our tickets, and then had a sad, silent walk through this haunting historic building. I'd been to the Anne Frank House on my last trip, but the second time wasn't any less depressing. The next few days consisted of a lot of wandering around the city, getting more lost, but eventually finding our way. 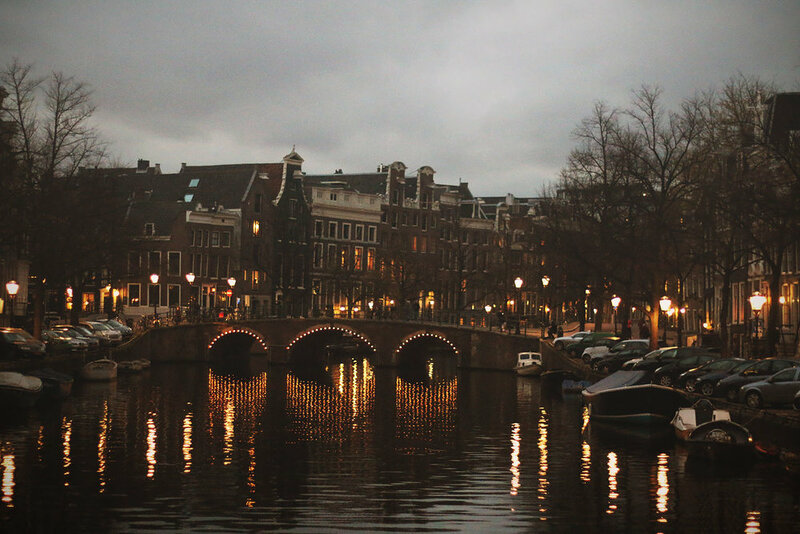 We went to the Rijksmusuem, a building full of Dutch art and history, the Van Gogh Musuem, the floating flower market, shopping area, and of course, the Red Light District. I can't get over how walkable this city is. I could totally see myself living here for a few months someday, walking or biking everywhere. Watch out for the bikers though, they don't exactly love the dumb tourists who unbeknownst get in their bike lane. I got the full fix of Amsterdam I had been craving, ever since that short visit two years ago, and I am now satisfied. Not even the second uncomfortable Megabus ride back to London could ruin the beautiful feeling I have about this city. It's a place full of friendly people, no annoying street sellers (unlike Paris and Rome), the most amazing Starbucks I've ever been too (seriously, it was nicer than any American one), and tasty food. I can't wait until my next trip there.